Size of this preview: 739 × 599 pixels. Other resolution: 296 × 240 pixels. 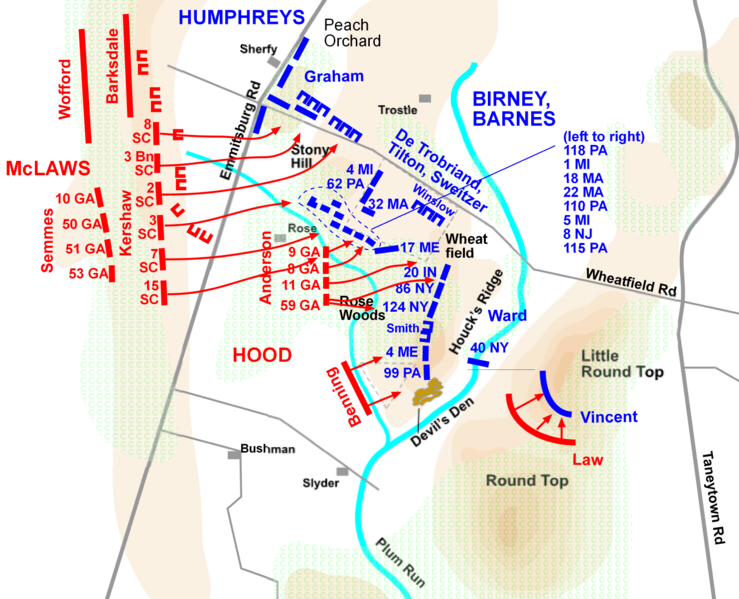 Battle of Gettysburg, Day 2 at the Wheatfield (part 1). Drawn by Hal Jespersen in Macromedia Freehand; source ) Image released to the public domain by the author. current 08:45, 6 September 2007 1,483 × 1,203 (510 kilobytes) Karajou (Talk | contribs) Battle of Gettysburg, Day 2 at the Wheatfield (part 1). Drawn by Hal Jespersen in Macromedia Freehand; source [http://www.posix.com/CWmaps/]) Image released to the public domain by the author. This page was last modified on 6 September 2007, at 08:45.